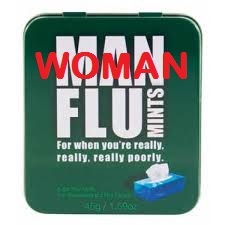 Ok, she hasn’t got Man Flu, she had Man Flu, it was last Friday to be precise. So Mrs Sensible and I trotted off to the doctors to see if there was a cure. While Mrs S went in to see the doctor, I sat in the waiting room listening to BBC Radio 4 on my new phone. I really should write a post about my new phone, I can listen to English radio, play games, count the calories I am not losing. The only thing it is not very good at, is holding a signal long enough for me to make a telephone call. When Mrs S came out of the doctor’s office, she had in her hand a fist full of prescriptions. 64 Euros it cost for the assortment of pills and potions she needed to get rid of the man flu. She also had a prescription for me. I tried to convince Mrs Sensible that I was suffering from just a little bit of puppy fat, or maybe excess winter fat that would go as soon as spring arrives. The problem is, Italians take their health and other people’s health really seriously. In Italy you don’t need to be ill to go to see a doctors, you can go and see him because… well because you think you might be ill in the future. 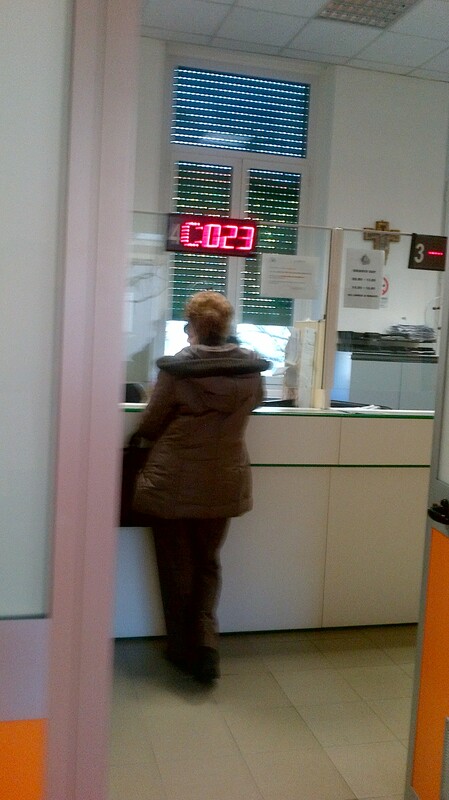 An Italian doctors surgery is more like a community center, it is full of healthy people passing the time of day. The sick Italians are all at home in bed, they just send their husbands to the waiting room with a list of their symptoms. 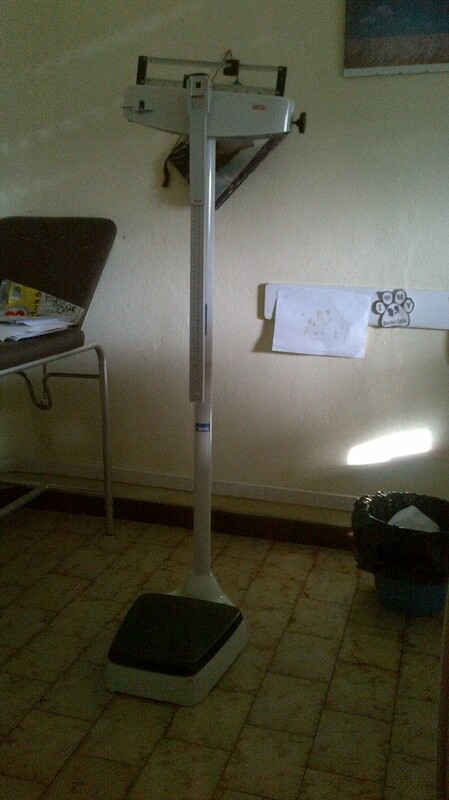 Today, I went to the hospital to see my personal dietitian. Of course, you now think I am grossly over weight, but I am not, I just need to eat a little less and run a bit more, instead of running a little less and eating a bit more. 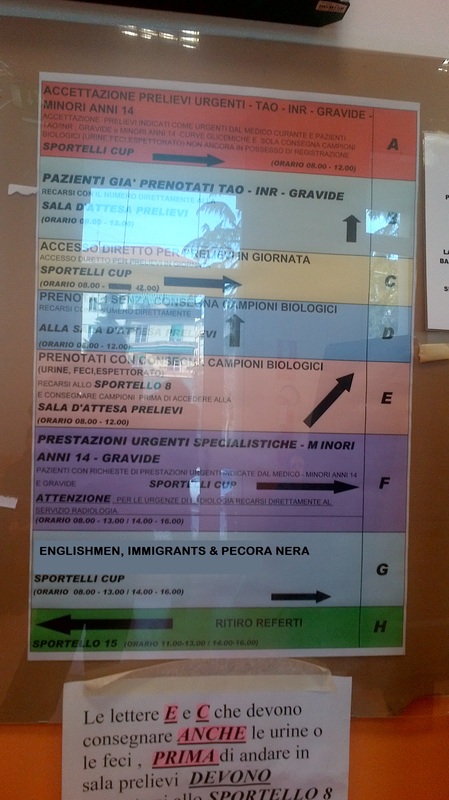 So arriving at the hospital, I was greeted by the bingo machine, I asked a women which ticket I needed and after perusing the machine she shrugged her shoulders and said ” no lo so” So I pressed ‘G’ If any of you can understand Italian, please will you have a look at the following and give me a translation for my next visit. 2 machines, neither made any sense. G19, Look at the holes in the metal chairs!!!! I wonder if they leave circles on your bum? 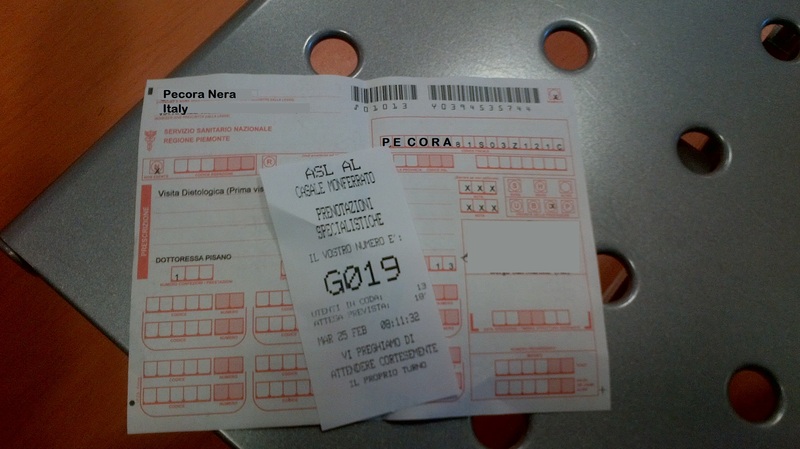 As I handed the woman my ticket (just to prove I hadn’t queue jumped) and my prescription, plus €50.00, yes we have to pay for treatment in Italy. She looked at me a bit strangely, I immediately knew what she was thinking, she was thinking, why does this slim good looking human specimen need to see a dietitian. In fact I had suggested the same thing to Mrs Sensible earlier today. After stamping my ticket, she refused my money and told me to go and pay next door. The hospital has a bank in the corridor and all payments are made here, despite it being a bank, they don’t accept debit cards, credit cards or even Tesco vouchers. They only accept real Italian Euros. Following the signs for the dietitian, I found this wonderful sign. At least I was heading towards the competent doctors, I wonder where the incompetent doctors worked? When I reached the dietitian Mrs Sensible was already there and waiting for me, she had already helped the doctor fill out my personal data. I was then interrogated as to my eating habits. Dr. What do you eat for breakfast? Dr. You don’t??? Why not? I don’t like breakfasts, I just have a cup of tea. Dr. Ahh, this is going to be difficult, he is English. What do you eat at lunch time? I don’t, if I am very hungry I will eat some breakfast cereals. I don’t tend to have time to eat during the day. Mrs Sensible then very helpfully told the doctor that I enjoy eating chocolates and biscuits, in fact she said I like to sit down in the evening with a glass of wine and a handful of biscuits. I didn’t take offence as this is perfectly normal behavior isn’t it? Dr. What do you drink? Water, erh a little wine, red or white. Dr. How much do you drink? mmm maybe 2 or 3 glasses, but not everyday. Dr. You will have drink only 1 glass a day. Mrs S. When we have friends over he sometimes he drinks more than 3 and he likes grappa. Dr. Well if you have a fiesta (party) then he is ok to drink more wine, but no grappa. PN to Mrs S That’s ok then, we will have a fiesta more often. So after I was weighed, measured and deloused a second appointment was booked when I will receive my diet sheet. I have had a couple of thoughts following the hospital visit. 1) If I am only allowed to drink one glass of wine a day, I need to buy bigger glasses. 2) If I am only allowed to enjoy a couple of glasses when friends visit, then I need to increase the number of my friends and invite them over more often. 3) I paid 46 Euros to be told I eat at the wrong time, eat the wrong foods and enjoy drinking too much wine oh and I need to exercise more. Mrs Sensible thinks it is money well spent because I will lose weight rather than be tutted at by the doctor at my next appointment. I think 46 euros would have been better spent on 8 bottles of Marco’s fine wine and a packet of biscuits. I know this is my second post in a day, but I have been absent for a while. I have a couple more to post over the following couple of days, and a lot of blogs to go and read. That’s where voice recognition software comes in handy. I’m sure your phone can do that, too. It probably can, it is just a shame it is useless for making phone calls. I am not surprised 🙂 My phone just can‘t pick up a signal. It might be better at the new house. Siri.. ? I have missed something. You don’t want to hook up with Siri. She’s a really smarmy git on my son’s iphone who tells you anything you want to know. A kind of self-opinionated encyclopedia crossed with the yellow pages. If you talk to her, she replies. He asked her where the nearest brothel was, and she told him. He’s SEVENTEEN YEARS OLD. Then he asked her where he could dispose of his mother’s body, and she told him the way to the local dump. Keep away from SIRI. Bad PN. I think SIRI can only be found scowling on iPhones. I bet the English version of her has a BBC accent and tramples over the microchip card wearing Jimmy Choos. You may be able to find a cheaper, gum-chewing version wearing C&A gear and plimsolls rather than Versace for your smart phone, but she’ll probably tell you to chop the body up and feed it to the dog. There was no post for such a long time. I was worried. Now I know you were trapped in the hospital. Definitely need bigger glasses, tankards, maybe? I have some pint glasses somewhere. Oh I really love your humour, so much that I became visual he he,he. It is the same in Spain with the doctors. I wonder if the doctor will include a bacon fry up on Saturday morning for me. I forgot to ask. She kept mentioning pasta!!! Ha ha ha ha ha, I forgot to ask the doctor if the wine I use to cook food is part of my daily allowance. To tell them that. Sorry, write from my mobile. p.s. Definitely buy a bigger glass. That’s just smart. I normally drink grappa from a proper grappa glass, but I have noticed that it looks remarkably similar to water when it is in a plain drinking glass. Mrs S is now monitoring my wine and eating habits, I wonder if she will notice. Grappa is wonderful, I love the expensive smooth stuff, but I am also partial to a glass of the home made stuff I get given. Yay, welcome back, Skinny guy! Woo hooo, thanks for the skinny bit. I really don’t think I am fat, not fat fat anyway. I think Mrs Sensible just wants me to get involved in the Italian hospital system. PS. I was once told ‘If you want to know which parts of your body need trimming down or removing, get naked and jump up and down in front of the mirror in your bedroom, anything that wobbles, that’s what you need to get rid of. Oh, my! The visual image that just gave me. And although I’m reading and eating lunch….I had just put the fork down and swallowed so no food coming out my nose. Also if I’m going to read your blog during meals I’d better get my cat trained in the Heimlich maneuver. (please excuse spelling of that as I don’t want to remove said cat from lap to get the dictionary). This is true. We are going on a cat hunt tomorrow. This made me laugh so much! Italian hypocondriacs, I happen to be one of them! (Too bad my host country has no compassion for people like me). Did you really spend 46 euros without getting a proper diet? I agree wine and chocolates would have been a better investment:) anyway, please keep writing, you even manage to make me miss Italy! 46 euros… lost forever. I was gobsmacked. If I knew the Italian for “I have changed my mind, I prefer to stay fat and cuddly” I would have asked for my money back. I will order one tonight. Ahh yes you are in Germany, can you bring me some sausage back? maybe call in on your way home. When I read your comment I wondered who you were talking about, but then I remembered, I am that young handsome, slim English black sheep. I should have added modest 😉 I’m back in LV – fancy some lard instead? Nahh, I remember eating dripping on toast when I was younger, 🙂 But I will stick to BEST sandwiches. Bacon, Egg, Sausage and Tomato. Shhh don’t tell the dietitian. You mean they might buy the expensive stuff? can you mention that you will be doing many miles a day walking around looking for scabby scooby? and you will need a nice glass of wine when you get home to refresh you and help you deal with the sorrow of another day without finding him? i see it all as therapy. You are a very wise young lady. I will take your advice. I love that glass. It is very cool. I will order it straight away. You can order two and give one to your dietician! Ha ha ha ha. I might just do that. She already thinks I am mad because I refuse to eat breakfast. Oh and I drink cappuccino after midday. Which is a no no in Italy. Psssh, breakfast is overrated. Maybe Italians are the mad ones? I agree, I could murder a bacon sandwich at 10.30am but when I am dragged out of bed at 6.30 in the morning the last thing I want is food. Yes, you have to build up to it. Maybe you can give lectures about it and convert people to your way of doing things! What healthy snack do you miss the most? Thanks for the laugh! 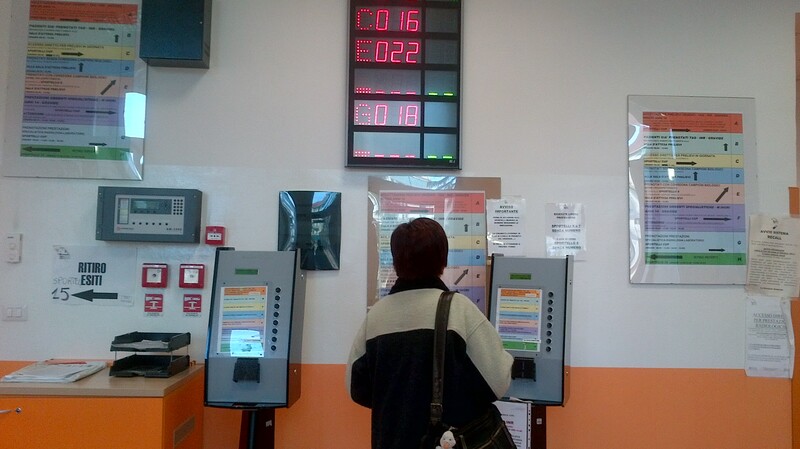 I’ve played your type of “hospital bingo” at the traffic office in Malaga! The continentals love these machines. Even the locals don’t understand them. I carry the wood to the fire everyday. I do at least 2 sit ups in the morning (One to switch off the alarm clock and another to try and climb out of bed) What more do I need to do. Besides it is just a little fat I gained to keep me warm during the cold winter months. I was gobsmacked that she booked the appointment, I thought she was kidding. Anyway I will have a bit of fun with the doctor, you should have seen her face when I explained that I don’t do breakfast and I don’t eat pasta at midday. I thought she was going to cross herself. 🙂 It’s not the pasta that’s the problem for me, it’s the litre of crème fraîche, the lardons and the tonne of parmesan I put with it. May I suggest taking Scooby’s disappearance as a sign, and adopting Gilda instead? You could both do five K a day. Cheaper and nicer than a diet. Gilda is just an eating machine. She digs up grubs and eats them. Nothing is safe. But… grappa!? Surely that can’t be unhealthy!? I reckon that dietician doesn’t know what he’s talking about. Biscuits wine and grappa is pretty much all your food groups. I say keep doing what you’re doing, and throw in the occasional trip to the hospital for a bit of exercise walking around in circles following the signs. You have it in one.. Going to the hospital is good practice for my Italian and miming skills. Besides biscuits are made from grain, wine and grappa from grapes. Surely a diet of gain and grappa can’t be bad for me..
You’re right though. There’s nothing unhealthy in either of those. Just ignore Mrs Sensible, you’re clearly already eating perfectly! PS When are you next over this way. Very soon… I’m just trying to figure out exact timings and I’ll be in touch as it would be great to stop in and see you! Don’t give me too much warning. 1 day warning = 1 day of house tidying. 5 days warning = 5 days of house hoovering and cleaning. Stick with 24 hours notice, or even yoo hoo guess who is at your front door. They have since come off I’m glad to say. It is Italian food, that is the problem. How can anyone resist one more little spoonful or offer of one more glass of wine. Well, you have lost a little weight going there. You’re a couple of grams lighter as you have just spent some bank notes and coins paying for the visit!! 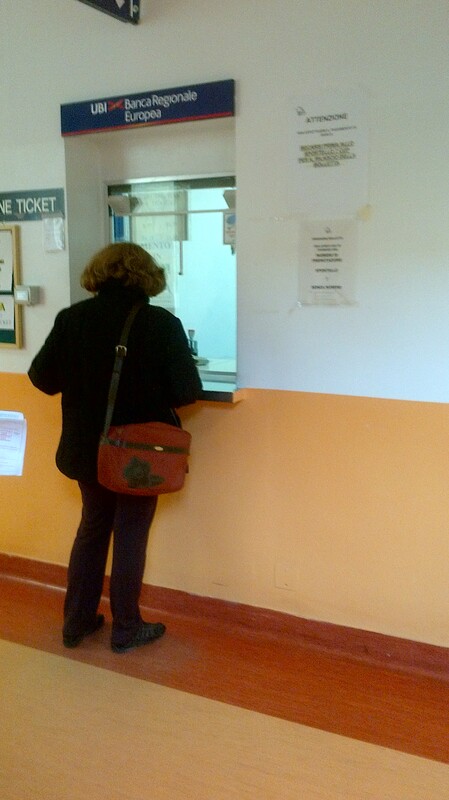 Ah yes, in Campania you would have lost more weight……your visit would have cost you 56 Euro here…..
Medico competente? This had me laughing out loud! Maybe your diet sheet will tell you to eat more food, you never know. Oh what a masterpice, this made me scream with laughter!!!!!! Your photos are magnificent and the competent doctors.. well!!!! Office of the council genius??? 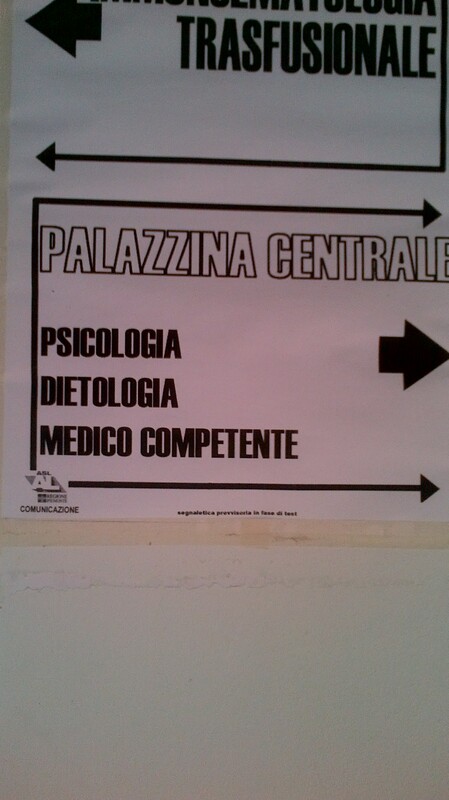 I had no idea there were any geniuses working on the council in Palermo. There is certainly no civic evidence of their ingenious workings….